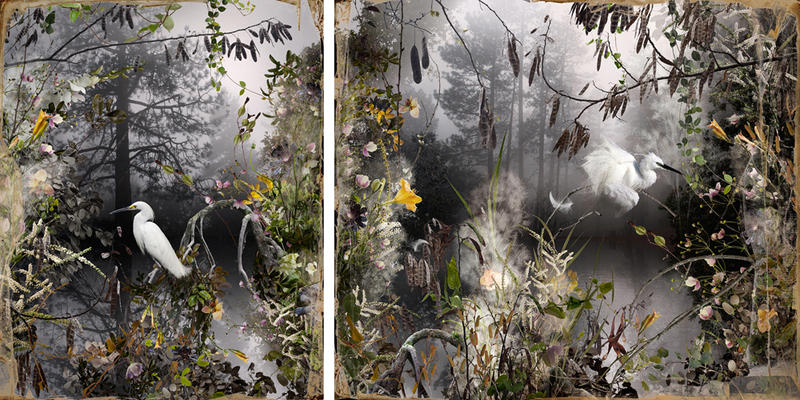 CEG is excited to be showing work by Ysabel LeMay at AIPAD 2014. Quebec born Ysabel LeMay’s artistic journey is itself a “Journey into Simplicity”. In 1987 she began a thriving career as a graphic artist working for several prominent advertising agencies before opening her own firm in Vancouver. Seeking greater fulfillment, she made a transition into the fine arts studying painting at the Emily Carr University of Art. In 2002, she left the world of corporate advertising behind devoting full-time to her painting. Since then, she has achieved much success with over 40 exhibitions throughout the United States, Europe and Canada. In 2010 she turned her full attention to photography. Combining her technical expertise with her deep-seated roots as a painter, LeMay continues her exploration into the power and divinity of nature through a unique process she calls “Photo-Fusion”. At first glance, you might think you are looking at a hyper-realistic painting. However, LeMay’s innovative technique is a lengthy process during which hundreds of photographs are taken and light and visual properties are attuned. She then assembles one detail at a time in a painterly fashion to form a single composition. In 2011 LeMay was selected the winner of KiptonArt Rising Star program in New York. Since then she exhibited in the US, Canada, Europe, Asia and The Netherlands. We also have an Ysabel LeMay’s work currently on display at the gallery. Please stop by CEG or visit us at AIPAD, booth #204. To see more work by Ysabel LeMay, click here. To see all the work we are showing at AIPAD, click here. Visit us at booth # 204. We hope to see you there! Thursday, April 10 from 11 a.m. to 7 p.m.
Friday, April 11 from 11 a.m. to 7 p.m.
Saturday, April 12 from 11 a.m. to 7 p.m.
Sunday, April 13 from 11 a.m. to 6 p.m.